Why Did My Lead Go Unmatched? Leads can go unmatched in the boberdoo system for many reasons. Not only does a lead need to match all of the exact parameters of a filter set in order to match, but there are also dozens of other checks that the lead needs to pass. Furthermore, even if a lead successfully matches to a buyer's filter set but the delivery of the lead fails, the lead will go unmatched. Because there are so many checks, the boberdoo lead distribution system matches leads to buyers on an exclusionary basis. This means, that we can report when a lead does not match, but cannot always recite the exact reason that the lead went unmatched. If your unmatched lead is displayed with a blue unmatched tag like the image above, your lead did not match to any active partner filter sets at the time the lead entered the system. The best way to troubleshoot the problem is to start with the four most common reason a lead goes unmatched. No matching filter set: Compare the lead details to the filter set specifications that you anticipate the lead matching with. Potential matching filter set not active: From your filter set page, make sure there is a green checkmark next to the filter set. If there is a red paused icon, this filter set is not active and won't match with a lead. Potential matching buyer account inactive: From your Partners tab, make sure the partner/buyer that you expected to buy the lead is set to Active. Potential matching buyer with insufficient funds: From your Partners tab, edit the partner you expected to buy the lead and access their Invoicing/Billing tab. If your partner has exceeded their credit limit or otherwise do not have any available funds, they will not be eligible to buy any leads. If each of these four settings check out and you still don't know why your lead went unmatched, then your lead is not selling for a less-common reason (see the list at the top of this page). Be sure to check through any technical settings you have set for your buyers and try again. If you still can't figure out the problem, our support team would be happy to help. If your unmatched lead is displayed with a red unmatched tag like the image above, your lead successfully matched to a filter set, but the lead delivery failed. 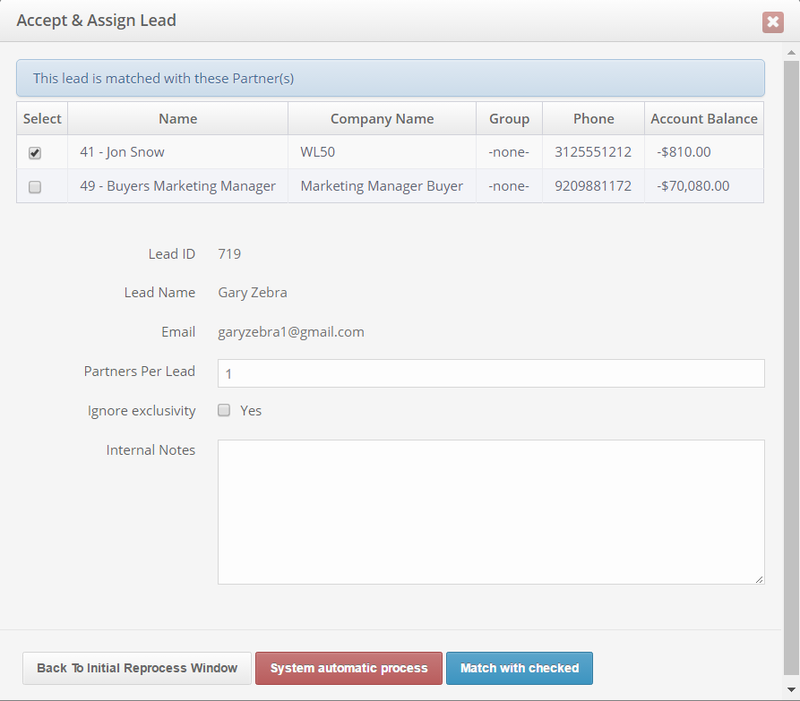 Because this lead was attempted to at least one lead buyer, we are able to record this interaction in the lead log. Reading the Lead Log To determine why this lead went unmatched, go to the Leads tab and open the unmatched lead's corresponding lead log. This popup displays all logs and attempted actions for this specific lead listing the most recent action at the top. Each log contains 2 rows. The bottom row of the log contains the response from your partner's system that was attempted. The next row up contains the error message for why your system did not consider the delivery a success. This log will display each attempted sale of the lead, allowing you to troubleshoot the reason the lead delivery failed. In this example, you'll see "No server is available to handle this request." In this case, you would need to contact your buyer directly to determine why their system was unavailable to receive the lead. For a full explanation on how to read a lead log, click here. Once you have identified and fixed the reason that your lead went unmatched, you can reprocess the lead to determine which buyers are now eligible to purchase the lead. From the Leads page use the unmatched lead's Reprocess Lead tool. This will pop a window that allows you to accept and assign or decline the lead. Click the Accept & Assign Lead button. If one or more buyers are eligible to purchase the lead, you will be given the option to automatically reprocess the lead or manually match the lead. The System automatic process button processes the lead as if it entered the system in real-time. This means the lead will match to the correct filter set(s) based on the business rules and priorities you have set up. The Match with checked button allows you to hand-pick the eligible buyers to match the lead to. If you click the Accept & Assign Lead button and there are still no eligible buyers, your lead will not reprocess and remain in the unmatched status. If you're still having trouble with an unmatched lead, our support team would be happy to help. Please consult our support page with all the ways to contact us.